Polystichum acrostichoides (Christmas fern) is an evergreen fern native to eastern North America from Nova Scotia west to Minnesota and south to Florida and eastern Texas. It is best grown in organically rich, dry to medium moisture, well-drained soils in part shade to full shade. The species typically grows in a fountain-like clump to 2' tall and features leathery, lance-shaped, evergreen (green at Christmas time as the common name suggests) fronds. The tocking shape of the pinnae also suggests Christmas. The young fiddleheads (Crosiers) in the spring are silvery and scaled. 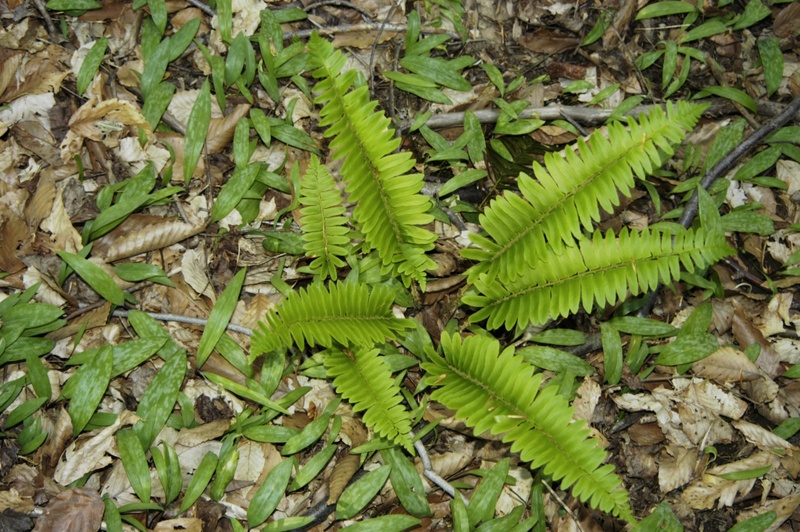 Sori appear on the undersides of the pinnae only at the ends of the fronds by late summer. The evergreen fronds provide good winter interest for the landscape, although by late winter they look a little tatty.. It has no serious insect or disease problems, 'tho crown rot in wet soils can be a problem, particularly in winter. This is a tough fern that tolerates dryish or moist soils in woodland gardens, shade gardens or shady areas of borders, wild or native plant gardens. It may also be planted in shady areas along walls or foundations. An adaptable plant for massing on slopes (including dryish, rocky ones) to help combat soil erosion.